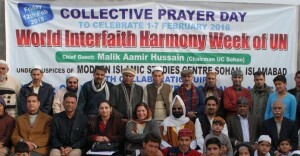 The celebrations of World Interfaith Harmony Week (WIHW) 2016 concluded at the Modern Islamic Studies Centre (MISC), Islamabad, with concerted efforts to create understanding between different faiths and religions in different parts of the country. A ‘Peace Prayer Day’ gathering was organised at the head office of Modern Islamic Studies Centre, Islamabad, which was attended by a large number of people from different faiths and religions. UC 21 (Sohan) Chairman Malik Amir Hussain was the chief guest on the occasion. Addressing the audience, MISC President Dr Allama AGR Chishti, said that the interfaith harmony is not a new phenomenon, as it was the path followed by Sufi saints of Indo-Pak subcontinent, as through this system they attracted attention of non-Muslims therefore it is responsibility of every Muslim to join this cause for betterment of Muslim Ummah,” he added. Dr Chishti was of the view that his visits to Bahawalnagar and Cholistan (February 1-2), Lahore (February 3), and particularly to Swat and its adjoining area, Besham (February 6), recently, was of great importance, as both later areas had been plagued by terrorism in past, but now have returned to normalcy after military operations there. “We visited a Tableeghi Centre and met Amir, Tableeghi Jamaat, Ahmad Khan. The elders of the Tableeghi Jamaat as well as tribal elders appreciated MISC’s gesture for visiting the centre and apprising them of interfaith harmony. They were of the view that the philosophy of interfaith harmony has become the need of the hour and could help our society recover from the losses inflicted by religious intolerance and terrorism in past. They said Common Word Initiative, Amman Message and celebrations of WIHW can help bring long lasting peace in tribal areas,” Dr Chishti added.